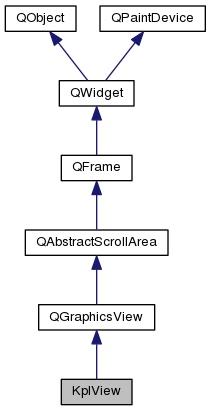 Displays the plot items of a KplScene. Provides methods for scrolling and zooming. parent pointer to parent widget. Emits the signal urlsDropped, transferring a list of URLs. Implements scrolling of the window by key sequences. Home scrolls to bottom margin. End scrolls to top margin. Ctrl+Home scrolls to left margin. Ctrl+End scrolls to right margin. Emitted when mouse cursor leaves the widget. Implements selection of a rectangular region using the mouse with its right button pressed. Implements initiation of selection of a rectangular region using the mouse with its right button pressed. Implements finishing of selection of a rectangular region using the mouse with its right button pressed. In this case the signal regionSelected is emitted, transferring the rectangle. Emitted when rectangular region was selected using the mouse with its right button pressed. rect rectangle in pixel units. units. Calculates recommended size of the widget. list pointer to list of dropped URLs.